PC Magazine: Rating: Execelleng (5 stars out of 5). Bottom Line: For photographers yearning to get their hands on an entry-level D-SLR, the D50 is the best choice. It’s simply a delightful camera to shoot with. Pros: Excellent picture quality and performance, user-friendly features, great price. Cons: 1.5X magnification factor. Imaging Resource reviews Nikon D50 digital camera and concludes that Nikon and Canon have been fierce rivals in the photo business for decades now, and the advent of the digital era has only intensified the competition. Of course, this is nothing but good news for the consumer, as the battle between these two rivals (not to mention the rest of the growing pack of manufacturers), has resulted in a continuing stream of innovation and cost-cutting. The latest result of this process is the new Nikon D50 digital SLR, delivering most of the features that made the D70 such an exceptional product, but at a lower price point and with the camera’s size and user interface retooled somewhat to better match the needs of the “family photographer.” – Or anyone else who wants a feature-rich, easy-to-use, compact (but not too much so) digital SLR for a bargain price. What was most surprising to me about the D50 though, was that its image sensor and some aspects of its image quality (notably noise levels) are actually superior to those of the higher-priced D70S. (Although it must be said that the D70S is no slouch at all in the noise department.) You do definitely give up some features relative to the D70S (see the list in the pro/con box above, and the comparison matrix at the top of the review), and the D50’s 18-55 mm “kit” lens clearly isn’t the equal of the very nice 18-70mm unit that ships with the D70. As I said back when I first laid eyes on the prototype sample of the D50, there’s just an awful lot to like here, from the just-right grip size that will feel comfortable across a wide range of hand sizes, to its excellent ease of use in “green zone,” to its a complete feature bound to appeal to more advanced users. 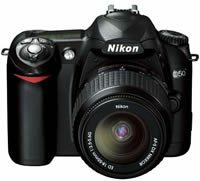 Bottom line, the Nikon D50 is just an excellent match for the aforementioned “family photographer,” or for anyone wanting exceptional value in an entry-level digital SLR. This is a camera that will get you started in the world of d-SLRs at an affordable price, but one that will also give you plenty of room to grow over the years, as your skills mature. Very highly recommended, a dead shoe-in as a Dave’s Pick.